November 15 “Friends & Family Friday” – Research shows that diabetes has a genetic component: Who in your family or circle of friends has diabetes? I’ve heard this genetic question a few too many times. I actually have NO family history of diabetes at the time of diagnosis (1998)— which all my doctors thought was very odd. Since then, my grandfather on my father’s side (I call him Opa) was diagnosed with type 2 diabetes. I have a lot of diabetic friends — a good part because I like to stay involved in the “Diabetic Community.” I have done the JDRF Walk to Cure Diabetes every year since 2001. Originally, I started with the Western New York Chapter of JDRF. A few years ago, I started working with the Westchester County Chapter and have met some more great people. Now, I have another team captain, who’s also diabetic, and wishes to raise funds for diabetes research too. I have gone to Meet-Up groups with other diabetics in my age range. And I also “meet” a lot of those (like myself) in the online community. The most important point I am trying to make is that you are not alone. Diabetes affects so many of us, and if you want to be involved and meet people who you can relate to — do it! Calla, you are so right. I have to admit that I have trouble meeting others with diabetes offline locally, but I’ve still managed to get it in here and there. Thanks for the reminder to reach out! 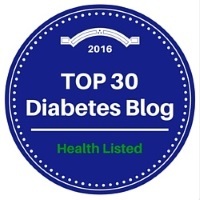 On that site, I found about 3 different diabetes related groups who wanted to share their experiences. Of course — I also live outside of NYC, so there might just be because of the amount of people in my surrounding area. Still worth a shot!